the Elfa Free Kids Storage unit from the containerstore.com. Click on the picture to get a larger view. Clear plastic totes are nice because we can see what’s inside. When I’m doing school work with my older children, my 3-year-old and 1-year-old have 30-45 minutes of independent playtime. My 3yo sits on a special “playtime” rug not far from our school table, and my 1yo sits in a playpen with toys of his own. I give my 3yo daughter a plastic bin filled with toys that I want her to play with during that time. Now, if I had to come up with things for each morning, I’d probably be boring and give her the same thing every day. But our toys are in totes like these, and I can see all of them at a glance in their spots on our shelves. I can easily rotate toys so that she has a different bin of toys to play with each morning. Educational things also make great toys. I see an ABC puzzle, musical instruments, playdough, books, paints and paper, and even an abacus. We bought an abacus just like this one for $1.99 at our local Salvation Army, and everyone loves playing with it, even our youngest little guy. Don’t be silly… the paints and craft paper should be up high, and the stuffed animals and balls should be down low. I’d also use bins that have lids, so that my younger children would be forced to ask my permission before getting toys out. Bright yellow walls are nice. My husband and I have been noticing that some colors are calming, but yellows and reds seem to give us energy and help us think creatively. Maybe it’s because we have a lot of gray days here in Minnesota, but I can use all the energy-giving color and brightness I can get! I don’t have yellow walls like this in our school room, but maybe someday! So now let me show you what my much-more-realistic toy shelves look like. Many of our bins are clear, plastic containers, but others are just cardboard boxes. Our “classic toys” consist of blocks, wedgits, Duplos, kitchen toys and dishes, blocks, cars and army men, Lincoln Logs, and more. Our “educational” toys include tangrams, board games, and yup, there’s that abacus! We have all our board games over on the left, puzzles up on top. What you can’t see in this picture is a big dresser filled with craft supplies, plus some cabinets. 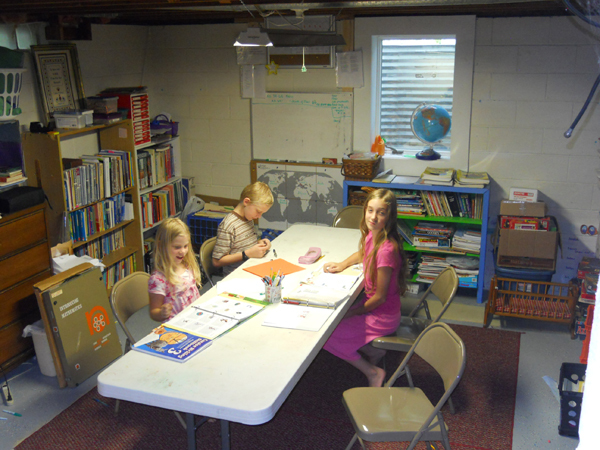 We also have bookshelves filled with our homeschooling books and supplies (see picture below). To the right of these shelves, we have some large totes filled with “dress-up” costumes and props, plus a big tote filled with little playhouses and plastic people. No bright yellow walls here. This is in our basement, but we do have a nice window that faces to the west, so we have sunshine in the afternoon. Our shelves aren’t as pretty as the ones from the Container Store either, but we spent less! Up high you can see some curtain rods that my husband hung, for the times when we want to just hide all this visual clutter. It’s all rather ugly, isn’t it? (No, the kids are cute…) You can see why I’m organizing down here… and you can probably figure out why I’m dreaming of clean, yellow walls, and perfectly organized bins. I doubt it will ever be a reality, especially since this designer probably doesn’t have seven children whom she’s homeschooling. But it never hurts to try to improve, right? What ideas do you use to organize your toys? Too right, Anne! The container store’s example is the toys of only *one* child sans the 72 cuddly toys in the big laundry hamper just out of view! I have a way of seeing a picture in a magazine and wanting my space to look like that too!! My husband keeps thinking he should enroll me in a Bins Anonymous Program. I usually stop fantasizing when I look at the price and the sticker shock does it for me! This lovely bin system did that. WOW…how many starving children could we feed for 700 dollars!! PS. My toy porch looks a lot more like your basement than like the fancy container store picture!! I notice that when I see some bins at the store, I imagine them holding all the duplos, play food, Mr. Potato Head pieces all nicely on the shelf. Then I bring them home and they aren’t near as big as I imagined and only hold a portion of the pieces or the opposite and they are way too big to fit on the shelves. I notice you have a lot of games, now I don’t feel so guilty because we have just as many. (Can’t help myself when I find them at the thrift store for $1). Those are sooooo hard to store tho, the boxes are all different sizes and the graphics on the boxes compete for attention. And then, when you stack more than 3 of them, the game the toddler wants is always on the bottom. No one notices when he pulls down a whole shelf full and then goes crazy, hey, this is fun, look at all these pieces!! I’m no help! I can’t think of anything that can make the toy area look less cluttered and more like the catalog pictures. I’ve tried different things and still get the cluttered look. Big cabinets with doors, now that would help. I love those older crafted homes that have those as built-ins. But to put them into our home, we just don’t have the money. Speaking of games, do you see the plastic bins on the bottom left, next to the “Mad Gab” game? Those hold game pieces for many board games, each game’s pieces in a labeled ziplock bag. The little white labels on the front of the bins tell which games are in that bin. The actual game boards are stacked just out of sight, but each has a label on it, too. Oh, and our kids have to ask permission before playing a game. The little ones are NOT allowed to touch. They usually play games either on this school table or up in our dining room. It works fairly well. About once a year, we have to open all the bins and re-organize all the pieces back into their proper places. Oh, and I have one little container that we put stray pieces in when we find them around the house. I think that it’s just a fact of life that every once in a while, we have to organize everything all over again. I hate that job! But I’m starting to see it as just a part of having a big family — and not a sign that we’re not organized or using the right system. 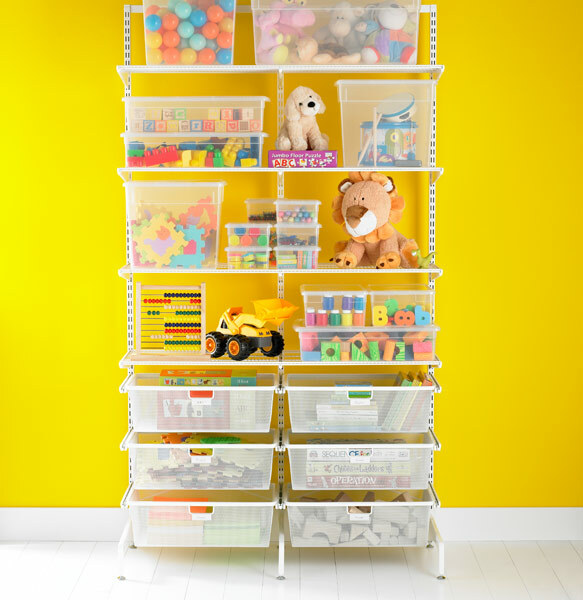 These are great suggestions for organizing! Thanks so much! I have such a love of board games, I’ll have 2 or 3 inside a box, like 3 types of Risk games in one box, 3 types of Clue in one box, Taboo and Taboo Jr. in one box. One box holds all those games that are basically a set of cards that can really be played without a board in one box (Balderdash, Charades, Wahtzit, etc, etc). 3 different geography games in one box. And I still don’t have room for all the boxes! I tried the ziplock bag method but didn’t have a good way of storing the ziplocks (didn’t think of bin like you use) and then the ziplocks themselves would get al grimy or ripped. This is a great thing, we do this too. It’s real nice for stray puzzle pieces. I would just like to cry. Sad/overwhelmed tears: We have 3 children, 6y, 3y and 10m, with one on the way, 2 cats and we live in less than 1000 square feet. I have a living room/school room/play room/sewing room/dining room. I can’t get rid of enough stuff to feel decluttered. I’ve even thought about finding a new home for our 2 cats, although that makes me even sadder. I know God is calling us out of debt and we need to do everything to accomplish that, but somedays my walls seem to collapse around me. Relief tears: Your thoughts and ideas are so simple. I need to hear that you have to redo your system every so often too. I love the idea of clear bins. I noticed the bins are stored flat. NEVER buy a bin box that has the bin at an angle. It’s awful!! I’ve been thinking about taking pictures of the walls, so I have space higher. I miss our board games and puzzles, because we’ve tried to put them up out of the way and now we never play. Thank you for bare honesty and showing us what reality really looks like. Angie, don’t cry! I totally understand how you feel! I’ve lived in 20-some houses in my life, and most of those have been quite small. The clutter can make your skin crawl, can’t it? Neither my husband and I are strong organizers and both struggle with pack rat-itis, so decluttering is a frequent task! I would love to hear your ideas for small spaces. Our school room is our dining room (the only eating area since we have a galley like kitchen). Our play room is the living room and the kids rooms. So I feel very cluttered and lived in all the time. No pretty show house here. Open shelves of books in the dining room, we have 2 china cabinets one in the living room and one in the dining room, one is crafts and school supplies the other games and toys. We don’t have the money to buy anything additional for storing and organizing so we must put what we have to the best possible use. We actually will be losing the living room for a few/several (only God knows) months as it becomes a hospital/recovery room next year when my husband has some major surgery (probably over the Christmas holiday too!). I actually have reoccurring dreams of adding onto our house and having a school room and recreation/play room. how wonderful that would be! Okay, I believe I am coveting those spaces now-time to move my brain on. This is a definite need in this ”spring cleaning” season. We also are doing our school in our dining room because we do not have extra space in our house. We have 7 children and 4 bedrooms and no extra rooms. Our hallway upstairs houses two bookcases with most of our school books and reading books. I also have a rolling 3-drawer organizer that has our arts and crafts in it (that our younger tried to get into). Our children’s bedrooms have their toys in it and I have a crate that holds from our 8 yo down to our 2 yo’s books for school (not that our 2 yo does school). What has helped us this season is we have purchased 2 9-cube organizers for our boys room and younger girls room. These take care of all the toys being all over the place. Now they are in bright colored bins that look really good in their rooms. The other thing we have done is redone our laundry room. We did have our school stuff in there but now it is strictly for laundry. We put in a shelving system with rods up so we can hang clothes as soon as they are done in the dryer and almost everybody has a wicker basket that has undies, socks, and pjs in it. It has helped so much to get the laundry done and not sitting in my living room for three days before finally being folded and I enjoy being in there because it is organized and a vibrant and cheery color. Now, if I could just get this schooling down pat with all the little ones, we would be doing pretty good. Decluttering along the way while organizing has helped me too (of course, it’s still not halfway done). Just for information, we bought all of our stuff at Lowe’s for relatively cheap and good quality. I love this. We live in one of those lovely older homes that someone mentioned (about 120 yrs old), but unfortunately don’t have the lovely built-ins, we have lovely windows. As nice as it is for catching a breeze, it isn’t nice for storage. Our school room has 6 windows that are about 2.5X6 ft EACH!!!!! We have no wall space for storage and it is about to drive me crazy!!!!! I do love those little sterilite shoebox sized containers for the boys educational toys, and has a shoe rack that fits 12 of them perfectly and within their reach so that they are able to utilize them as they finish their assignments and are waiting for their next instructions. I found that products specifically intended for toys are generally very inefficient space-wise, as well as very expensive. Since board games seem to be the hardest things to fit in most storage systems, I looked particularly for furniture that would hold them. We used to store most of our toys, games, and craft supplies in two armoires (intended for clothing), which I got on sale. They hold an amazing amount of stuff if well-organized. Board game boxes fit across the top shelf. The rest of the cabinet was divided in half, so we installed all the shelves on one side and put a three-drawer storage unit (cheap from WalMart) on the other side. That eliminated the problem of having too many things stacked. The best part was that when the doors were closed, there was no “visual clutter”. When those were ruined by flooding, we replaced them with kitchen cabinets from a cabinet company that was going out of business. They are deep enough to hold board games, which we put on their sides book-style to avoid stacking problems. The drawers are perfect for smaller items like cards, yo-yos, etc. The countertop can be used for additional storage or for Lego creations that are being saved. A couple of wall cabinets work out great for smaller items and things we don’t want taken out without permission. When the doors are closed the only things seen are those on the countertop. Thank you for your ideas and encouragement! I hope my ideas help someone to “think outside the toy box”. We rent half of a small duplex, and there are seven of us. The clutter breeds in every corner and flat surface. Some things I have done to minimize the visual offense is to cover empty diaper boxes in contact paper and store toys inside. I order large rolls online so I can get my favorite color in a small discreet design. I put sheets over my plastic toy shelves from Walmart. Except the bathroom, bookcases are in every room, even the hallway. I have organized books first by age-related, then topic and size of book! I can get more shorter books on the shelf by stacking them than if they stood the usual way. It keeps it neater. As much as possible (I am a scavenger, the house is “eclectic”) I try to keep the colors or prints similar. It doesn’t make a small space any larger, but it looks more intentional and it is less of an affront to senses. I love color and would choose to have lots of different colors throughout the house, but by sticking to just a couple of colors it helps decrease the mental chaos of our crowded, busy space. Second-hand shops are great for picking up sheets, comforters, throw pillows and such to pull a place together. We have a few local shops that have periodic half-price days that make this a fairly inexpensive fix, even on a very tight budget. It is worth my sanity and helps the kids too, to have an orderly home.